Mama Love: 20 Realistic FREE ways to keep kids entertained indoors! 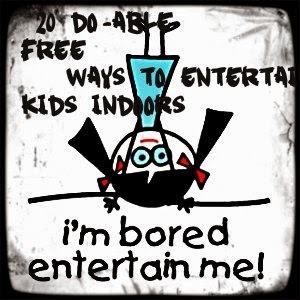 20 Realistic FREE ways to keep kids entertained indoors! Here is a List of my boredom busters for kids (estimated age range 3-7) That wont have you running to the store to buy a million things to keep them entertained! It all started over Christmas break from school after being home for 2+weeks, the weather was horrible outside so they were trapped indoors, and I noticed all my children were doing was watching TV and it was driving me crazy, I am in no way a TV watcher I cannot sit down long enough to just watch TV, and I hate when they sit around like blobs on the couch watching TV all Day! So I knew I had to come up with something to get them up off the couch and not telling me that they are bored every 5 minutes: The next morning while drinking my morning coffee I quickly jotted down a list of their favorite activities to do around the house, that would NOT require me to run to the store to buy supplies ( I hate when I find cool stuff to do with kids then realize I have no supplies to Make/do any of it!) So this list Should be a completely FREE list of Fun for kids and feel free to tweak it to work for you and your family! Anyways here is the list we came up with and just so you know after making this list they did not watch any TV the rest of their school break with the exception to #10! 4. Play Hotel: I love this one they use their bedrooms for the "hotel rooms" and the beauty of it is they willingly go clean their rooms and make their beds for their "guest to stay in them"
9. Play a game: Uno, Candyland, Monopoly Whatever you have or whatever is your favorite just sit down and play a few games, I have a 3 year old who really can't play certain games on her own so easy solution is be on the little ones team, I hold the uno cards but she gets to lay them down and shout UNO! 10. Watch a Movie (With Popcorn): Sometimes we just all need some down time and a movie will do that, I let my oldest daughter and son go pick out a Movie that they all will like and grab my 3 year old and head up to the kitchen to break out the Whirley pop, Fresh made popcorn and a good movie on the couch with a mountain of blankets is wonderful! 12. Make a Treasure/Scavenger Hunt: Come up with a list of objects for them to find in the house or we hid candy throughout the house for them to find, we've also used Batman Action figures and just hid them for them to hunt for, ideas are endless you can use really anything! 13. Build a Fort/Tent: Let them take blankets and pillows and create their very own fort/tent, we usually end up in our family room, where we have a rather large ottoman which is great for fort building, we've also made them in between my girls' beds under the dining table and etc. I give them our camping lantern and they climb in and read or color! 14. Make Marshmallow Towers: use Spaghetti noodles (dried) with marshmallows stuck on the ends are wonderful to build shapes and towers with and they can eat the marshmallows when their done! 15. Give them a bath: Most kids love baths, i know mine do, throw in some fun toys that won't get ruined in the water and make a giant bubble bath, you'll have happy and clean Kids! 16. Let them Play Video Games: Unlike the usual keep kids off of games ideas I say occasionally it's alright and even better when you play together, I love having tetris battles with them it's one of my favorite games and they love competing playing against everyone! other favorite games of ours are Little big planet and any of the lego games! 17. Puzzles: We have a cabinet full of puzzles that we hadn't done in a while so it was a great thing to bring out and they loved it! 18. A Chore: My not sound like total fun but give them a little project to do it has them help out with housework and keeps them busy! My 6 year old daughter likes to fold towels, my 7 year old son likes to make beds, and my 3 year old daughter likes to water plants or put up silverware, it may not be a totally fun project and no they may not do it perfect but it helps them learn! 20. Dress Up: Boys and Girls both can do this: My son has batman, Ironman, Cowboys, Knights and etc costumes and my girls have tutus princess, cowgirls, animals etc They love dressing up and usually end up playing a game of batman saves the princess or something once they are in their costumes! Also after spending a few days doing these I wrote down each activity on a strip of paper and folded them and stuck them in a jar so anytime I hear "I'm bored" I just point to the jar and they pull out a piece a have a fun random activity to do! So far this has worked wonderfully for us! What are your tips on how to keep kids entertained inside?